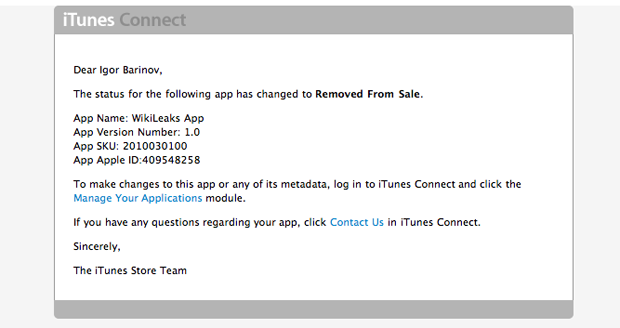 Looks like an unofficial iPhone and iPad app that let you view WikiLeaks site content and follow the WikiLeaks Twitter account on the go has been removed from the App app store earlier today. The app used to be available here (here’s the Google cache). 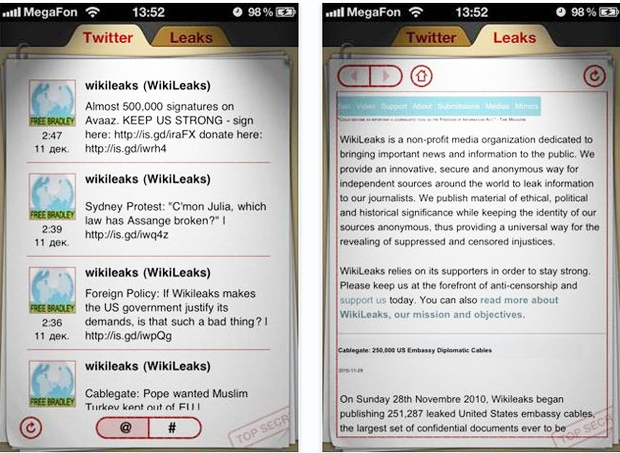 Basically the paid app was selling WikiLeaks content (available for free) for $1.99. Its entry into the app store on December 17th was actually surprising, as Apple is usually quite strict and somewhat vague about its app approval standards. WikiLeaks and founder Julian Assange are quite controversial, to put it lightly but I’m not sure if the app directly violated anything in Apple’s TOS. In the past couple of weeks corporate biggies Amazon, PayPal, Mastercard, Visa and Bank of America have all tried to disassociate themselves in one way or another from WikiLeaks. If this isn’t some kind of glitch, Apple has plenty company. I’ve contacted both Apple and and the developer for more information and will update this post when they respond. Update: Developer Igor Barinov responds with the following official status update, showing that the app was indeed removed from sale.